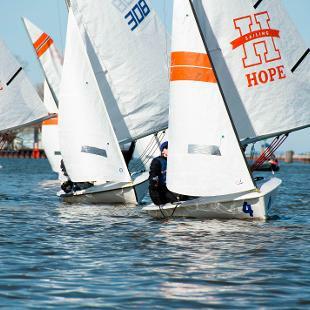 Hope sailing club serves to provide a fun environment to introduce novices to the sport of sailing and allow more experienced sailors to hone their racing skills. 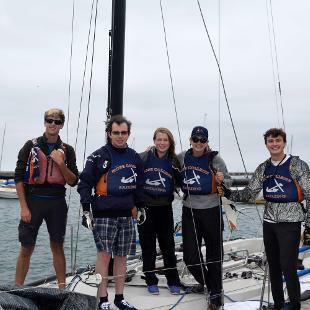 The sailing team is one of the few clubs that travels to other schools, such as Wisconsin-Madison, University of Michigan and Western Michigan University, to compete. There are, on average, five to eight regattas per season. 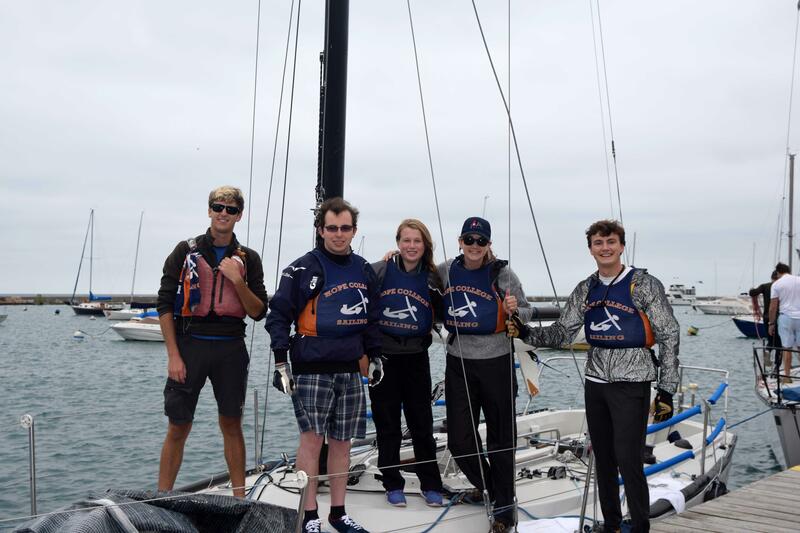 Attending regattas is a great way to become a better sailor and to foster relationships with other team members, as well as with sailors from other schools. The Hope Sailing team practices at Macatawa Bay Yacht Club on Lake Macatawa. 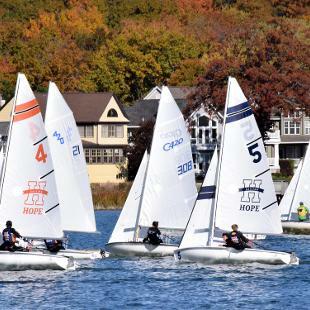 The team is a full member of the Midwest Collegiate Sailing Association. Practices are held Mondays through Thursdays from 3–6 p.m. (weather permitting). Sailors meet at the anchor and carpool to Macatawa Bay Yacht Club. Similar to other club sports, attending every practice isn't required for each sailor, but individuals and the team as a whole benefit greatly from consistent attendance. The team will consider attendance when it comes time to compete in regattas; however, previous racing experience is not required to join the team and participate in regattas! We have a great program that benefits from experienced student sailors and a coach from MBYC, so no matter what your sailing experience or skill level is, you have the opportunity to become better! Nick Hovland, Director of the Macatawa Bay Junior Sailing Association, is the head coach of the Hope sailing club. Coach Hovland has a degree in commercial recreation from University of Minnesota-Twin Cities. He spent more than six years as waterfront director at the White Bear Sailing School in Minnesota and has had years of successful racing experience. 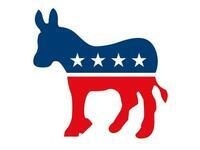 Macatawa Bay Yacht Club is located at 2157 South Shore Dr., Holland, MI, 49423. Take 17th Street west. 17th Street turns onto South Shore Drive. Continue on South Shore for about eight miles and Macatawa Bay Yacht Club will be on the right. All supplies are provided; from the boats and lifejackets to drysuits and boots, we've got you covered! 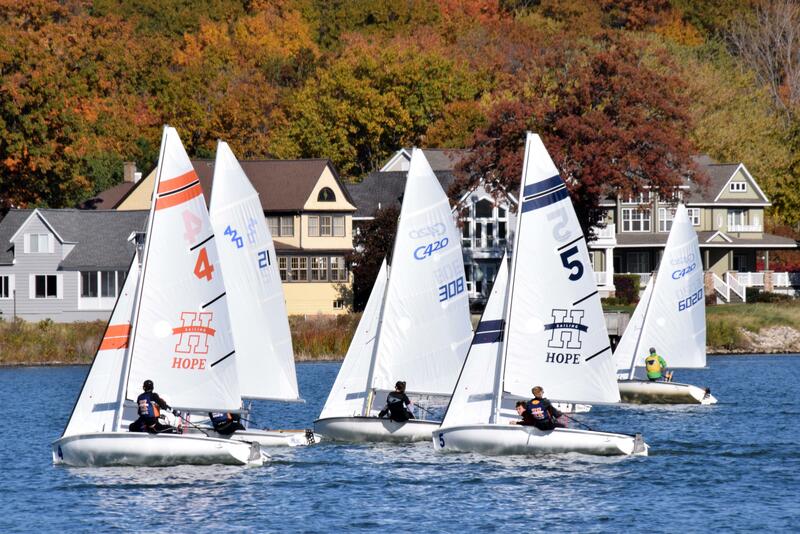 The sailing team owns and practices on a fleet of seven new 420s, purchased in fall 2015 (pictured above). 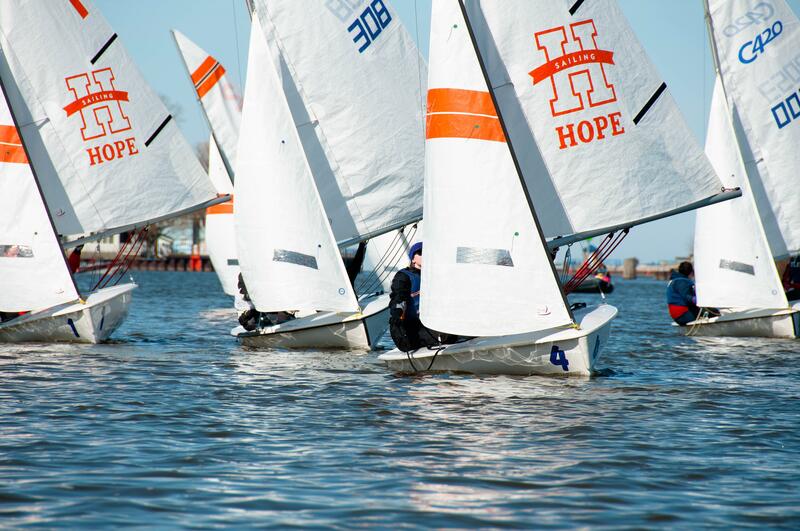 Contact Coach Hovland via email at nick@mbja.org, or reach the club email at sailing@hope.edu.